Leeds was bursting with Fairtrade events during Fairtrade Fortnight 2019. The group connected with local schools, businesses and churches as well as the university. 1 March Schools’ Fairtrade Celebration held at Leeds Civic Hall. Approximately 60 children attended from 15 schools. Fabian Hamilton M.P. opened the event and the Lord Mayor closed it. 2 March Coffee Morning at the Methodist Church Hall in Chapel Allerton. As well as cakes and coffee there was a Traidcraft stall, a Zaytoun stall, and Fair Grounds – a fairly traded jewellery company. 5 March Fairtrade stall at Leeds University Fairtrade Fair. 7 March Fairtrade stall at Lyons Davidson Solicitors. We were invited to have a stall in the foyer of the company. 9 March Fairtrade stall at Cardigan Road Co-op. In conjuction with the manager of the shop, we gave free tastings of Co-op wine and chocolate, with a display of every other Fairtrade product in the store. Christmas can be a festival of consumerism but more and more of us are trying to shop ethically and give gifts with a heart. There are lots of fair trade shops in the region, as well as some of the UK’s biggest fair trade suppliers. Black Yak – Working with knitters in Nepal for over 20 years they sell on markets around the region and are regulars on York market. They also supply some of the other fair trade shops. Ethical Roots – Selling online and at events in the York area, Ethical Roots stocks a range of fairly traded gifts, clothing and accessories and homewares. Fair Grounds – Winner of the Ethical Trade Award at Glastonbury, Fair Grounds sources their goods from a range of countries including Palestine, Uganda and Mexico. They sell at festivals, markets and online, as well as supplying a number of fair trade shops. Fair Trader – Based at 32-34 Huddersfield Road, Holmfirth, HD9 2JS the shop stocks a wide range of Fairtrade food and drink, fairly traded crafts and gifts, toys and fashion accessories. Harrogate Fair Trade Shop – Packed into the porch of St Peter’s Church, Harrogate HG1 1RW this is a little gem of a shop. They have now opened a dedicated Christmas area with fair trade Christmas decorations as well as a great range of Fairtrade food and drink and fairly traded gift ideas. Namaste UK – Based in Skipton this is one of the biggest fair trade suppliers in the UK. 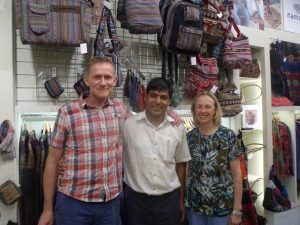 Dealing direct with producers in India, Nepal, Thailand, Vietnam and more they supply most fair trade shops in the UK with gift items, accessories and clothing. Samsara Crafts – You’ll find this shop at Unit 40 (on the slope!) in the Princes Quay shopping centre in Hull. They have been buying direct from their producer groups in Indonesia for many years but you will also find goods from other fair trade suppliers. Shared Earth – The region’s only WFTO member, their shop at 1 Minster Gates, York YO1 7HL stocks a wide range of fairly traded craft, gift and food items mainly sourced direct from their producer groups around the world. Shared Earth is also one of the biggest suppliers for the UK’s fair trade shops. Sonia’s Smile – This fair trade shop at 85 Main Street, Haworth BD22 8DA specialises in fair trade jewellery, accessories and clothing from around the world but you can also find a range of Fairtrade food. Suma – This Halifax- based co-operative is one of the main suppliers of organic, vegan, and Fairtrade food and drink to shops including fair trade shops. The Africa House – Based in North Yorkshire, The Africa House sources craft and gift items from Kenya, Tanzania, Zambia and Malawi. They sell online and supply to shops. York Scarves – As the name suggests they specialise in scarves – from basic net scarves to beautifully woven and dyed silk scarves their Indian artisans live in one of the poorest areas of India. They supply fair trade shops. Gooooooal!! Pupils from across Leeds and Wakefield put Fairtrade in the back of the net! 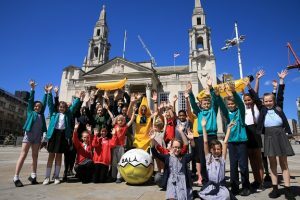 Friday 22nd June saw schools from across Leeds and Wakefield come together to celebrate Fairtrade and learn about the people who make footballs at Leeds Civic Hall. This annual event, run in partnership with Leeds Development Education Centre (DEC) and Fairtrade Leeds for the 8th year, featured special guest Angus Coull from Bala Fairtrade Sports balls. Pupils had a go at making their own footballs and learnt about how Fairtrade means that football workers in Pakistan can now benefit from free eye care and subsidised glasses and free school books and backpacks for workers’ children. The Fairtrade Premium also part funds projects such as water purification plants located just outside the factory gates so that anyone in the community can take advantage of free, safe drinking water. “It is particularly important that we focus on the people who create the footballs during this World Cup, who often are paid low wages for the hours of work they put into stitching the balls together” said Hannah Langdana, from Leeds DEC. The Coop sponsored the event and provided real life case studies of how Fairtrade can change the lives of the farmers and their communities. Other special guests included Hilary Benn MP who said it was a “Fantastic event” and the Lord Mayor of Leeds Cllr Graham Latty. Stalls were run by The Beehive Fairtrade shop, Europe Direct and Leeds DEC.
Sam and Rachel Brummitt of Namaste and Jhaindra Ghimire (centre). This year the Fair Trade wholesaler and retailer, Namaste are celebrating 20 years in business. On 17th July an event was held at the company’s Skipton head office and show rooms. Staff, customers, Fair Trade supporters and Namaste well-wishers were all invited. Guest of honour was the long-standing clothing supplier from Nepal, Jhaindra Ghimire. Jhaindra is from Sujha Traders and Exports and is a member of Fair Trade Group Nepal. 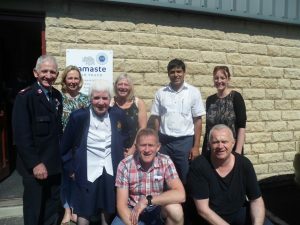 The Chief Executive of Child Rescue Nepal, Jo Bego also attended and gave a presentation on the work of the charity, which Namaste has supported for over 15 years. Child Rescue frees children from slavery. In Nepal there are 100,000 children who are working in extremely hazardous situations and suffer frequent physical and emotional abuse. The charity works with local police to free children from the workplaces where they are being held captive and then supports those children, where possible reuniting them with their families. “Namaste, simply translated as ‘Welcome’ in Nepal, was the result of an inspirational year of travel to Nepal & India. The idea for the business developed through meeting people making crafts for a living. We still remember our first products arriving on the farm where we had our first barn warehouse, complete with chickens and wellies. Development from then on has been organic growth over the years. Our philosophy is simple, fairly traded products which celebrate the very best of traditional handmade skills. We offer an extensive range including gifts, home accessories, furnishings, furniture, clothing & accessories, jewellery and incense, fairly traded from the far corners of the world. Back row from left: Alan Hickman (Fairtrade Skipton), Rachel Brummitt, Marie Hickman (Fairtrade Skipton), Susan Radford (director), Jhaindra Ghimire and Jo Bego. Front: Sam and John Brummitt (directors). Following the presentations guests could browse the vast range of Namaste products and help the company celebrate by joining in the feast, which included Nepalese curries and a traditional Yorkshire high tea. 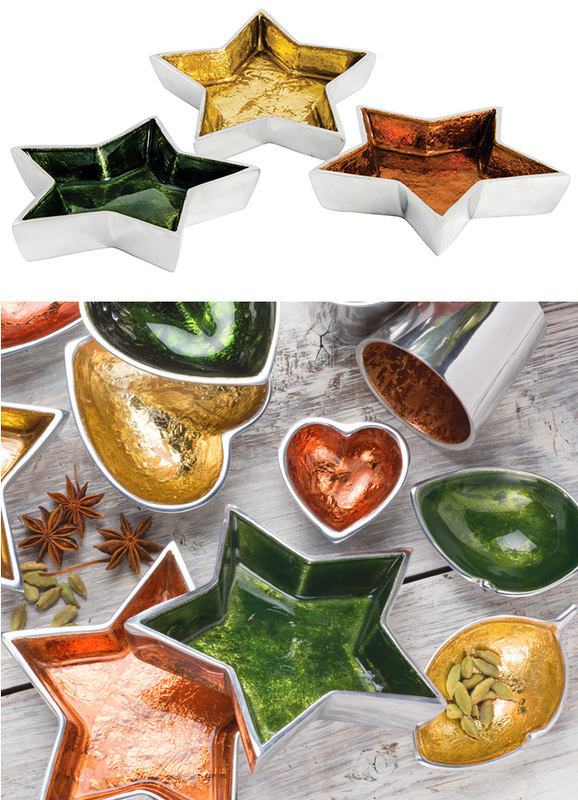 Namaste have a large showroom in Skipton or you can visit them online www.namaste-uk.com. 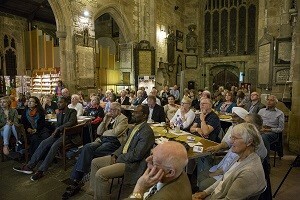 Bradford and bling came together with a presentation on Fairtrade gold at Bradford Cathedral on 12th September. Dan Omondi Odida, a gold miner from Kenya, came to speak to a crowd of seventy Fairtrade supporters, including attendees from the University of Bradford. The Dean welcomed everyone to the Cathedral and ethical jewellers Rory McQuaid (the Ethical Jeweller, Otley) and Caroline Kindy (Element Jewellery, Hebden Bridge) supported Dan in the presentation, alongside Adam Gardner from the national Fairtrade Foundation and Mark Dawson and Karen Palframan of Fairtrade Yorkshire. Dan spoke of the need for Fairtrade gold in order to address injustice in the gold trade. This includes the lack of a fair price, child labour, ill health as a result of processing the gold, and environmental damage caused by gold mining. Fairtrade gold guarantees a fair price and a Fairtrade premium in addition (which can be spent by gold mining cooperatives to improve life in their communities). The Fairtrade gold scheme includes safety and environmental standards. Fairtrade gold rings will also be available from Argos. Hot on the heels of the launch of Fairtrade Halifax, a campaign for Fairtrade Town status has been launched in Selby. 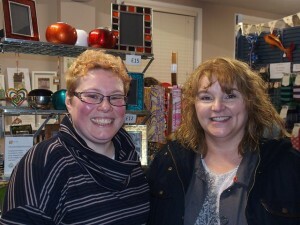 A launch event was held at the ‘All’s Fair’ Fair Trade shop in Selby’s historic Counting House on 19th November. Students from Cawood School gave an impressive presentation detailing the work that the school has done to promote Fair Trade; the school’s Fairtrade Steering Group was the first organisation to call for Selby to become a Fairtrade Town. 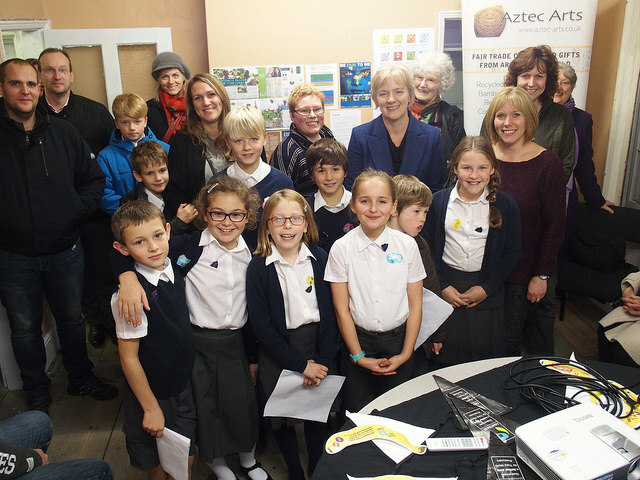 The ‘All’s Fair’ shop was packed for the event and the campaign for Fairtrade Town status was officially launched by Yorkshire Euro MEP, Linda McAvan. 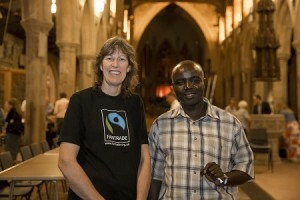 Joanna Pollard, owner of ‘All’s Fair’, and the Coordinator of Fairtrade Selby, gave a rousing speech to kickstart the campaign and everyone in attendance was invited to sign the petition calling on Selby Town Council to support the Fairtrade Town status. The petition has been endorsed by the Bishop of Selby. ‘All’s Fair’ will give Selby shoppers the chance to purchase a wide range of Fairtrade and fairly traded goods, including beautiful craft products from around the globe. Councillor Eva Lambert, of Selby Town Council, welcomed the campaign and also the opening of ‘All’s Fair’ in the historic Counting House. The building is part of the medieval Abbot’s Staithe complex which local people hope will be restored to its former glory. Visit All’s Fair at the Counting House, 79 Micklegate, Selby and pick up the perfect gift for Christmas. See the All’s Fair website. Photos courtesy of Robin Stokes. SHARED INTEREST SOCIETY: SHARING IN A FAIRER WORLD TO FINANCE A BETTER FUTURE. Shared Interest Society is an ethical investment organisation, using investment from people living in the UK to provide fair finance to small holder farmers and handcraft makers in 65 countries. We are owned and controlled by 8,940 members who collectively invest over £31 million. Together we form the vital link between UK social investors and fair trade organisations needing finance to improve their livelihoods. In 2013, our finance reached 375 fair trade organisations globally and we made payments of £46.8m to fair trade producers and buyers across the world. As one loan is repaid, these funds are lent out again to another organisation seeking fair finance. 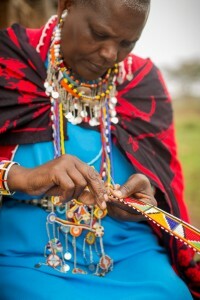 Shared Interest have been financing Kenyan women’s handcraft producers Namayiana for six years now. The group began over 20 years ago. Most women could not read or write, but wished to use the skills they had to care for their children and the community around them. Starting with just 16 members, they have grown their membership to 112. Patterns in their beautiful, traditional beadwork tell a story about a person’s life. Shared Interest Society is supporting them in their journey by providing much-needed finance to bring this beadwork to customers around the world. The biggest impact of their finance has been a loan which enabled the group to install electricity in the village for the whole community. Based in Holmfirth, fairandfunky is a Community Interest Company with the mission statement: “empowering people to take their own little steps to change the world”. fairandfunky deliver a range of creative and interactive workshops on Fairtrade, recycling and the environment, with schools and community groups across Yorkshire. Each fairandfunky workshop uses practical role-play to empower participants to think about their sense of place in the world. A range of activities maintain a engaging pace throughout the workshops, with debate, video presentations, practical tasks and creativity. Do get in touch with fairandfunky for more information and to book a fairandfunky workshop for your school or community group. Alongside schools across Yorkshire fairandfunky have also led workshops with Fairtrade Keighley, The Fairtrade Foundation, Holmfirth Arts Festival, Huddersfield Food and Drink Festival and The Co-operative Group. fairandfunky also sell a range of Fairtrade, recycled and organic products via their website www.fairandfunky.com and pop-up at a range of events. Keep up to date with news from fairandfunky on their facebook: www.facebook.com/fairandfunky and twitter: www.twitter.com/fair_funky. 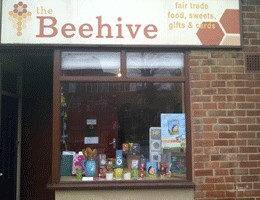 The Beehive in Chapel Allerton, Leeds, is a small business run by volunteers selling Fair Trade products to our local communities and providing information on Fair Trade and related issues. The shop runs on a not for profit basis. Any surplus money is given to fair trade charities – mainly Traidcraft Exchange. The shop aims to run with consideration for the environment and in an ethical manner. They sell tea, coffee, cocoa, chocolate (lots! ), rice, pasta, sugar, dried fruit, nuts, muesli, preserves, biscuits, cards, crafts, jewellery, gifts, and much more. They also provide customised packs for stalls on a Sale or Return basis for coffee mornings, fairs, church or school events – this means you can have a fair trade stall without having to pay for goods upfront and what you don’t sell they will take back. They may also be available to run a stall at an event you have. Find out more and get in touch with them at http://www.thebeehiveshop.org.uk/. 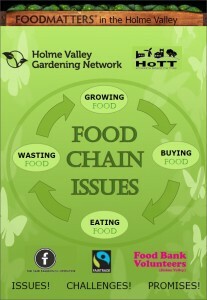 A group of organisations including the The Holmfirth Fair Traders Co-operative have produced a pamphlet entitled “Food Chain Issues”. It’s a good in-depth introduction to the huge subject of the ethics of food – from buying and growing local, to animal welfare and of course Fair Trade. It’s focussed on the Holme Valley but sets out some challenges for us all to think about and proposes a number of promises we could make, for a more positive impact on our planet and society.